Every golfer should play in Scotland, the birthplace of our great game. Our expert knowledge of Scotland and it's legendary golf courses will create Scottish golf vacations to suit all budgets and group sizes. Clients are provided with a complete planning service including a choice of tour packages, hotel accommodations, tee times, transport, tourism, sightseeing itineraries, and charter services. How about a custom golf package for you centered around the ‘Home of Golf’ in St. Andrews? - include the Old Course and other spectacular Open Championship courses such as Carnoustie, Royal Troon, Muirfield, Turnberry’s Ailsa, and Prestwick Golf Club. To complete your trip you may want to include “Hidden Gems” like Cruden Bay, Kingsbarns, Royal Aberdeen, Royal Dornoch, and the spectacular new Castle Stuart Golf Course. Please have a look at our suggested Scotalnd Golf Itineraries below, then give us a call, and we'll design a custom Scotland Golf Package for you. Here's a sampling of just a few of the fantastic links golf itineraries Scotland has to offer! 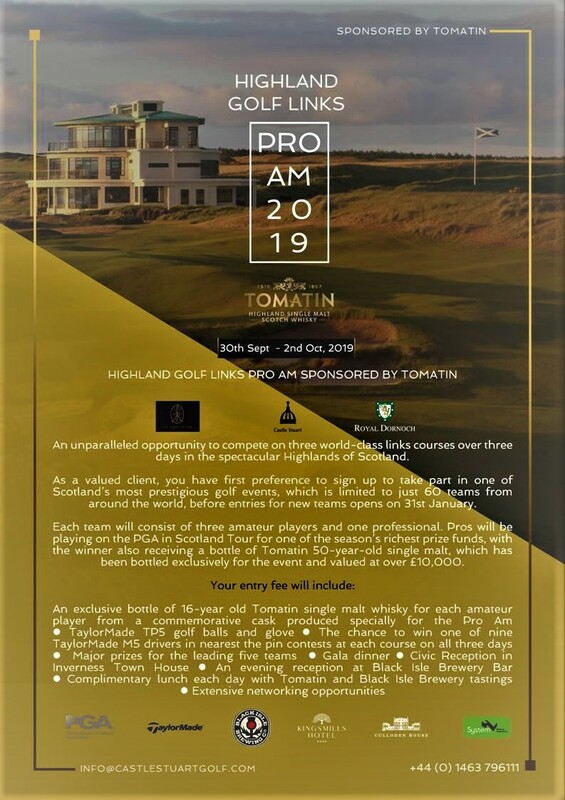 Bring your team of 3 Amateurs and 1 PGA Pro to Scotland's Highlands to compete in Europe's most exclusive and richest Amateur Tournaments! Compete to win prize money and a 50 year-old bottle of Scotch Whiskey, valued at over $13000! The Gleneagles International Pro-Am offers an outstanding all-around tournament experience and the chance to enjoy some of the finest golf and hospitality Scotland has to offer. From ball markers, birdies and bunkers, to cocktails, Champagne and canapés – the event combines four days of competition played over three world-class courses with luxury accommodation, fine dining, outstanding prizes, and an exceptional social program. Enjoy great golf, good fellowship and excellent cuisine!